Heat oven to 400°F. In 12-inch ovenpoof skillet, melt butter over medium-high heat. Rub chicken breasts with salt; add to skillet. Cook 3 to 4 minutes or until browned on first side. Turn; cook 3 to 4 minutes longer or until browned on second side. Transfer to plate; cover to keep warm. In small bowl, mix remaining 1 tablespoon brown sugar, the rice vinegar, chili garlic sauce and soy sauce. 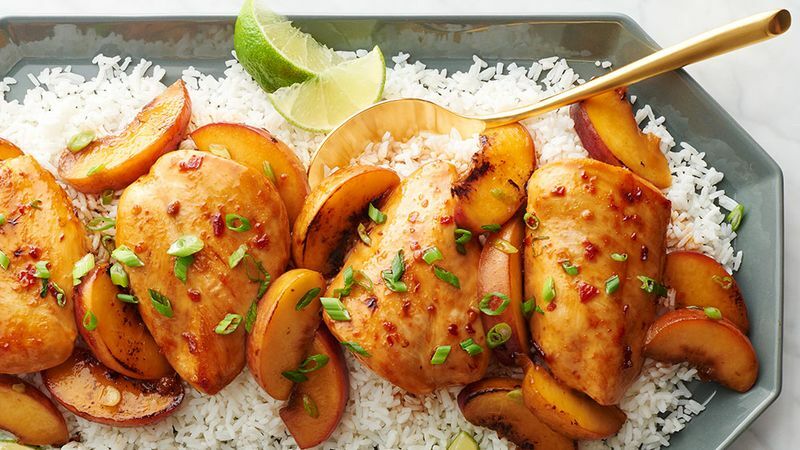 Place chicken on top of peaches in skillet; brush rice vinegar mixture over breasts. Bake 16 to 20 minutes or until juice of chicken is clear when center of thickest part is cut (at least 165°F). Top with green onion greens. Serve with lime wedges and rice. Prefer the flavor of chicken thighs? Substitute 1 1/4 lb boneless skinless thighs for the breasts.